guns n roses | Music or Space Shuttle? The Final 4 votes have been tallied and we are down to the last two songs! Neither of the match-ups were particularly close. Both winning songs collected roughly 75% of the votes. 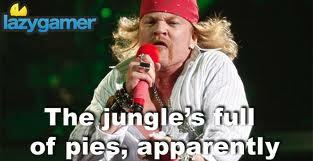 In the final round, Guns N Roses, “Welcome to the Jungle” will match-up against Nirvana, “Smells Like Teen Spirit.” Wow. This is going to be a tough decision. The Elite 8 votes have been tallied and we are down to the Final 4 songs. We lost another #1 seed as #2 Rolling Stones bumped off Jimi Hendrix in the closest voting of the round. They will go up against Nirvana, who handily won their match-up against Led Zeppelin. On the other side of the bracket, Prince advanced in yet another close match-up as he narrowly beat The Doors. He will go head to head with Guns n Roses in his bid to advance to the finals. The votes are in and we only had one #1 seed get knocked off! The Beatles “A Hard Days Night” was beaten by The Doors “Break On Through” by one single vote. Wowzer. I know I was shocked. Many of the match-ups were quite close. Prince narrowly defeated The Smashing Pumpkins by 2 votes and Beck squeaked past The Ramones by just a few ballots. You can see how valuable your votes are so keep it up and invite your friends to participate too. It’s time again baby! That’s right, the most exciting event since the invention of the bracket, MoSS? Madness 2014. This year we are keeping with the Sweet 16 model from last year. Why only 16? Well, many reasons. First, no early round snoozer match-ups. Who wants to sit through a bunch of blow outs before we get into the good stuff? Second, I’m lazy. I can only spend so much time at my PC using Google Docs and MS Paint for this stuff. Third, what’s with all the questions? Just go with it and mind your business. This year you are going to be voting for your favorite “Side One, Track One” song. Not familiar with the term “Side One, Track One?” Remember back in the old days when we had to listen to albums and tapes? We’re talking about the rare instance when an artist or band kicks off side one of their album with a particularly great song. Most times (not all the time) this turns out to be the start of an excellent album as a whole. Others times the artist blows their wad right away and the rest of the album is,well, a turd. With only 16 songs in the competition, many songs didn’t make the cut. Some of your favorites may not be on the mix. Can’t wait to hear about the ones we should have included. Really. Give us hell in the comments. You may be wondering, “How can one choose between such beloved classics as “Let’s Go Crazy” and “Smells Like Teen Spirit?” A difficult task no doubt. You’ll have to figure that out if you want to help us crown the MoSS? Madness 2014 Champion. Also, everyone should send their condolences to Chris. His Iowa Hawkeyes lost in their bid to get into the NCAA round of 64 last night. Valiant effort though boys. Now I expect you all to be cheering for my #3 seeded Iowa State Cyclones. Let’s go Clones! First things first, vote below!